The simplest NEP engine [Bussard and DeLauer, 1958, pp. 328-330] consists of a conventional nuclear reactor supplying heat to a thermodynamic cycle using standard machinery (for instance, a gas turbine, or a Stirling engine). The mechanical power extracted runs an electric generator. This generator feeds an electric arc, converting back electric into thermal power. The propellant is injected into the arc chamber, is heated by the arc and then expanded in a conventional nozzle. Estimated (ideal!) Isp is «3,000 s-4,500 s. In reality, not all propellant going through the arc is effectively heated, and in any case is not heated uniformly. Therefore the practical Isp of arc heaters is typically a factor 2-3 lower than ideal [Auweter-Kurtz and Kurtz, 2003]. 2003], and may eventually reach ^3,000 N/m2, a very interesting value for an electric thruster. Conceptually, the arcjet mode of operation may be questioned because it is based on a double energy conversion, thermal to electric and then electric to thermal. 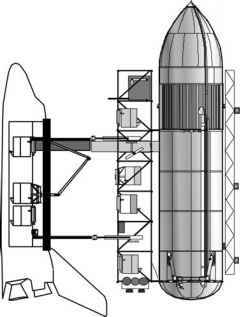 The fortunes of this concept are tied to a certain simplicity in reaching high temperatures without worrying too much about structural material limits, since the propellant is heated by an arc (mostly by convection and diffusion) and not by a heat exchanger. A serious concern, partly explaining the low Isp of the arcjet, is that much of the heat absorbed by the propellant while traversing the high-temperature arc is stored in vibrational and electronic excitation modes, i.e., in non-equilibrium internal modes. During the nozzle expansion this non-equilibrium energy should hopefully convert into flow translation energy, that is, the propellant flow velocity should increase, become uniform and collimated (aligned with the nozzle axis). However, this hoped-for result does not necessarily occur when the expansion is fast and starts from large non-equilibrium temperatures (arc temperatures may reach 25,000 K). What happens is that part of the thermal energy remains trapped (''frozen'' is the technical term) inside the heated gas. The difficulty of heating all propellant uniformly, and the fact that a good fraction of the energy taken from the arc has no time to convert into kinetic energy of the flow are strong reasons justifying why arcjets have been somewhat neglected as propulsion systems, either for conventional or for nuclear electric propulsion. This said, hybrid arcjets (i.e., arcjets feeding plasma to an induction heating section) currently look promising for large-power (>100kW) thrusters [Auweter-Kurtz, 2005; Auweter-Kurtz and Kurtz, 2008]. Modules assembled together in a power pack (and suitably cooled) could produce thrust of the order 10 N/100 kW or higher, an excellent value when utilizing a nuclear reactor.